Home > Snap Hook > Dog Hook | Bolt Snap Hook > SG114 Alloy Swivel Bolt Snap Hook 1/4"
This high quality alloy bolt snap hook is smarter, and more decorative than the average hooks. Bolt snap hooks with a sprung lever clip. Use these bolt snap hooks for attaching fabric or leather handles to D rings or, on straps for bag closures. 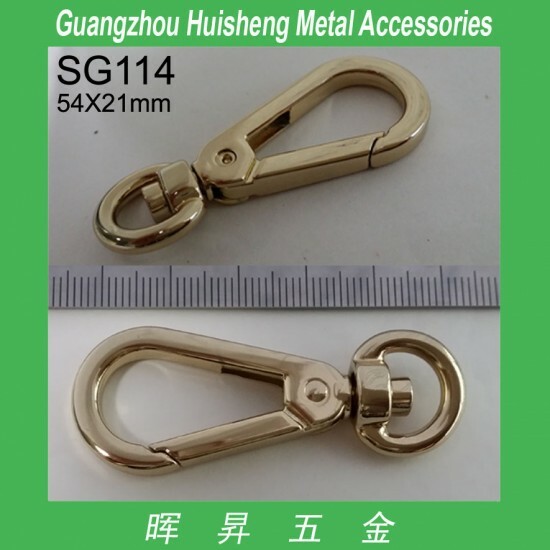 2) Bolt Snap Hook Material: zinc alloy. 3) Bolt Snap Hook Color: nickle, brushed nickle, brass, bronze, black nickle, copper, gold, brushed anti brass, anti silver, chrome, other metalic color is available.